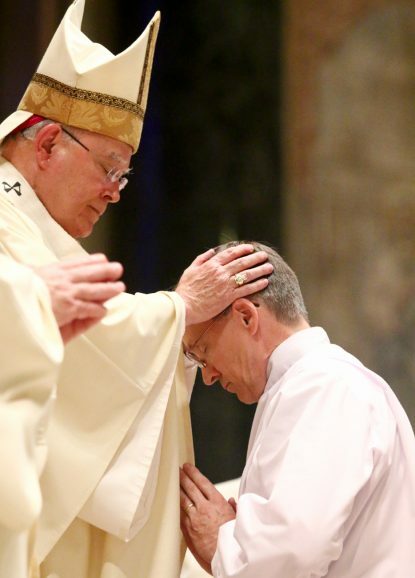 Sixteen men drawn from various walks of life — chemist, doctor, driver, sales director, engineer, pharmacist and accountant, just to name a few — were ordained as permanent deacons by Archbishop Charles Chaput on the morning of June 9 at the Cathedral Basilica of SS. Peter and Paul. In keeping with the Mass readings they have all been found to be “dignified, not deceitful, not addicted to drink, not greedy for sordid gain, holding fast to the mystery of the faith with a clear conscience” (1Tim. 3:8-9). Joining with the archbishop for the solemn yet festive ceremony were the four active auxiliary bishops of Philadelphia, Bishop Timothy Senior, Bishop John McIntyre, Bishop Michael Fitzgerald and Bishop Edward Deliman, along with Norbertine Abbot Dominic Rossi, scores of priests and many, many brother deacons. Needless to say, the cathedral was filled with a multitude of proud family members, friends and parishioners of the various parishes where they will serve. Proudest of all were the sixteen wives who accompanied their husbands on this spiritual journey. In his homily Archbishop Chaput spoke of the level of alienation in society today including loneliness as a mounting health problem, and the rising rate of suicide — for example in Pennsylvania, a 34 percent increase in self-inflicted deaths in the two decades from 1995 to 2016. As related in the first reading from the Acts of the Apostles, the Hellenists (Greeks or other non-Jews) in the early church complained that their widows were neglected in the charitable distributions of the congregation, and the first seven deacons were appointed by the apostles to minister to all. “The seven men were like yourselves chosen for the purpose of healing the brokenness in the church,” Archbishop Chaput told his new deacons. 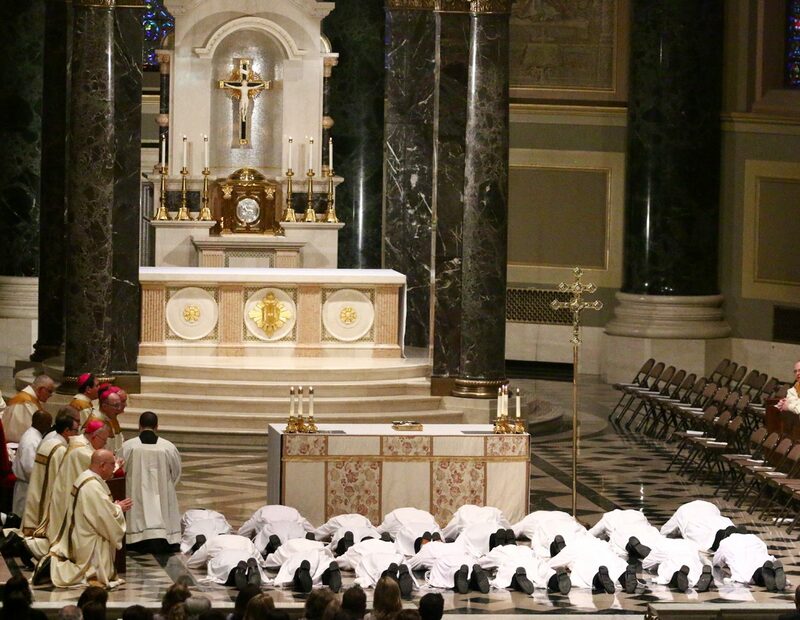 At the close of the Mass during which the ordination rite took place, Archbishop Chaput announced each new deacon’s assignment, which in almost all cases was to his home parish. Deacon John Hess entered the program seven years ago as a member of St. Elizabeth Parish in Chester Springs. His pastor asked if he would consider becoming a deacon, and he agreed to enter the formation program. “I feel very blessed, it is overwhelming, and my wife Sandra is excited too,” he said. Because Deacon Hess is moving, he was assigned to his new parish, St. John the Evangelist in Morrisville. Among the most interested of those attending the ordination were the pastors of the parishes the new deacons will serve. For example Msgr. Patrick Sweeney of Holy Family Parish in Manayunk was there for Deacon James Browne. Deacon David Matour receives the Book of Gospels from Archbishop Chaput. The permanent diaconate is indeed a ministry of service and these 16 newly ordained deacons come with 32 willing hands. 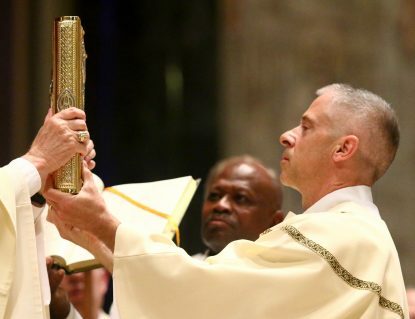 This year’s permanent deacon ordination class was exceptionally large but there are about 50 men in the seven-year formation program, explained Father Patrick Brady, who is the Dean of the School of Diaconal Formation at St. Charles Borromeo Seminary. Men interested in learning more about it should see their pastor or contact Deacon Mike Pascarella of the Philadelphia Archdiocese at 215-587-4532. Hearty congratulations. Wishing the Deacons strength and stamina in the exercise of their diakonia. What a marvelous gift of the Spirit that is offered to those who accepted the call to become deacons. In addition it is a gift given to the parishes in which these men are asked to service. It should fill the hearts of the faithful with joy! It does mine.